This week we’ve been digging deep into Facebook Live Video. Earlier in the week I shared 10 benefits of building Facebook Live into your strategy and yesterday shared 12 different types of Facebook Live videos that you might like to create. Today I want to get practical and give you some tips on how to create the best Facebook Live Videos you can. These come my own experiences of creating live videos as well as what I’ve picked up from others. I’d love to hear your own tips on using the platform in comments below. I should also say that most of these tips come from the outline of a Facebook Live Video that I did last week where I talked about this very topic. You can watch that video below (or keep scrolling to get a written version plus a few more tips that I’ve since come up with). 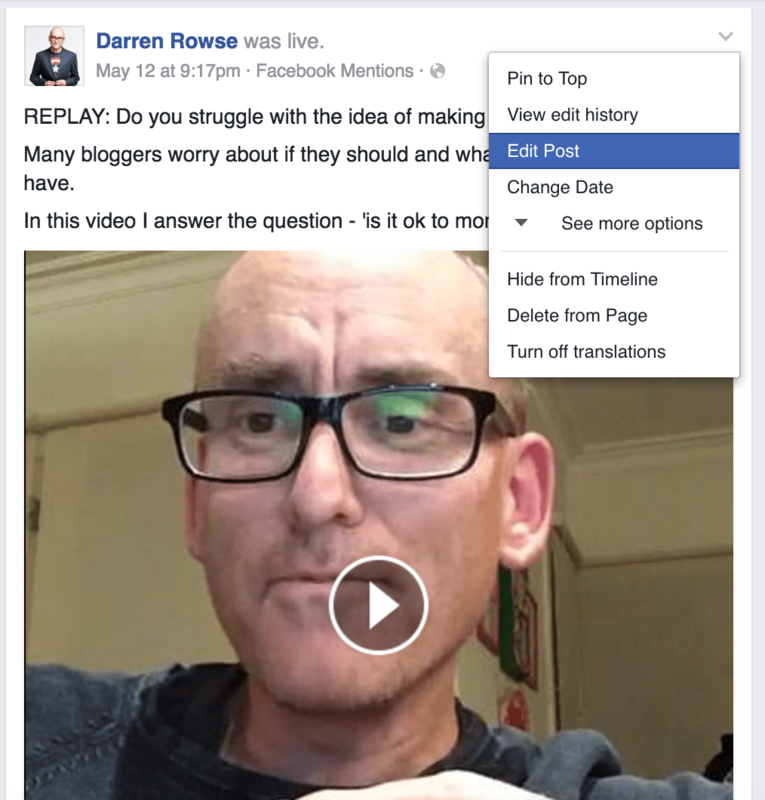 I didn’t include this in my initial list of tips but I had a few questions about the real basics of where you create these videos so… if you want to do a Facebook Live video you need to do it from the Facebook App on your phone. Alternatively if you use Facebook’s Pages App to update your page or if you’re a verified Facebook Page you can do it from the Facebook Mentions App (note: if you are verified you should use Facebook Mentions, I’ve heard it gives you even more reach than other FB apps). The following screenshots were from iOS’s ‘Pages’ app. Whatever app you use – look for the ‘Publish’ icon (the one you would hit for making any update to your page from your app). On the next screen look for the Live Video icon (a little person icon with halo like circles around their head). Click this. On the next page you can enter a description for your video (tips on this below). It’ll also tell you when your internet connection is strong enough for you to go live. If you have a good connection the button will turn blue and you can hit ‘go live’. It’ll count down from 3 to 0 (quickly fix your hair…. 3 seconds is more than enough for me) and you’ll be live! OK – lets take a step back from going live and ponder a really important question. What are you going to do on your video? I remember my first live video experience with Periscope. I hit the button that set the whole thing live by accident and then suddenly found myself LIVE with 4 people watching and no idea what I should talk about. I bumbled through it but it quickly taught me that you should always have some kind of plan for the video you’re going to make. Depending upon the type of video you make (see yesterday’s post for some of the options) this will mean different things but for me when I’m doing a teaching presentation I usually preprepared a bullet point list of the points I want to make. I also make note of any Calls to Action I want to make, things I need to promote, links that I might share and questions I’m going to ask people to answer. One of the big challenges with live video is getting enough people to watch it to make it an interactive experience and to make it worthwhile for you to put the work into preparing and doing it. This is particularly a challenge if you don’t have a lot of followers on your Facebook page so I would highly recommend putting some effort into getting people to your live video by promoting it. I suspect most of these approaches will be most effective if you do them shortly before you go live. People are not going to wait around too long for you. Alternatively if you develop a bit of a rhythm of doing video at the same time every day (or week) then you might help to build some expectation in your followers of when to show up. You might want to also think about educating your followers about Facebook Live too – particularly if your audience isn’t very tech savvy. For example telling them things like letting them know to click the video to make the sound happen, that they can leave a comment at any time and you’ll see it on your phone etc might help them feel more comfortable with the experience. I’d also promote ahead of time what you’ll be doing on the video and how it’ll benefit them to show up. I’ve experimented with a variety of times for doing Facebook Live Videos and have found that while I’ve got enough followers to be able to get a decent audience at most times of the day that there are certain times that seem to work better than others for me. My audience is pretty global but there is a large segment of ProBlogger readers in the US – so obviously when the bulk of the US is awake is a good time for me. That’s a fairly large window though and being in Australia myself there is a lot of the US day when I’m asleep – so I’ve been experimenting with timing my videos for first thing in the morning US time (the end of the day for me) and evenings US time (my mornings). Both of these times have worked well but the few times that I’ve tried it during US business hours I’ve had mixed results. What I would suggest is using Facebook Page Insights to identify the peak times when your page followers are online and see how you go with doing videos at those times. So for my audience at ProBlogger Facebook Insights gives me this data on when my audience is on Facebook (to find this go to your ‘Insights’ and then the ‘Posts’ section. These are Australian times so as you see the peak is pretty late for me so I try to time mine for late evenings to capitalise on the rise at about 10-11pm my time (and it also means that the replay is fresh during the peak) and then if I hit it around 9am my time I get the tail end of the peak time. I’m yet to try broadcasting into my Facebook group but I think it’d definitely be a worthwhile thing to do if you own one and want to really deepen the connection you have with that group. I’ve seen a number of group owners do daily videos to teach members of their groups, to run challenges with their groups and as part of mastermind experiences. The main challenge of course is that most groups have smaller memberships which is great for intimacy but you’d really want to work hard to promote what time the video would happen to try to get as many members to it as possible. While we’re talking about ‘groups’ – you can actually broadcast a live video onto a page that you own AND a group that you own. In fact you can have it going live onto multiple pages and groups. The way to do this is to set up your broadcast on your Facebook Page and then once its live get your page up on another device and hit the ‘share’ link and then you can share it to your profile, a page you have admin rights for or a group. Facebook won’t let you go live until it determines that you have a strong connection which is great – but if you have an internet connection that gets flakey at times you’ll want to try to get the strongest signal that you can because you don’t want to drop mid video. So find a place where you’re near your wifi unit if you can! If your connection begins to waver you sometimes get a warning mid video that you’re in danger of dropping out – this can give you a little time to move where you’re at so watch to see if you get an alert. 4G has also worked well for me when I’m somewhere on location – however again this can get flakey so test your signal strength before hand if you can and be aware that you’ll chew through a lot of data if you do a long video. As you’ll see in the screenshots above, before you go live you are asked to give a description of the video. This is really important as people will make a decision on whether to watch based upon it. It’s the equivalent of the headline/title of your blog posts. You can change this description later after the video has finished to make it more appropriate for those watching the replay so tailor it to attract live viewers. I often make my description incorporate the word LIVE for this reason and then try to find a benefit for viewers to draw them into watching. Once you go live a little icon with the number of people watching will come up at the top of your phone’s screen. Don’t be discouraged if there are only a few people (if any) watching in your first few minutes as it takes time for your audience to find your video. You can speed this up by promoting it (as mentioned above) but other than that the only people who will find your live video will be those who happen to be on Facebook at that very moment scrolling through their newsfeed. This means that the longer you’re on the more people will see your video in their feed. I find that my audience usually takes at least 10 minutes to get to it’s peak and sometimes it can be as long as 20 minutes. This means you might be talking to yourself a little for the first few minutes which can feel awkward. I’ve seen many people give up on their video in the first couple of minutes for this reason. As a result I think it can be worth coming to the video with something that you could talk about for those first few minutes before you begin what it is that you want to get into. Perhaps tell a personal story, share what you’re going to talk about, show where you are, give a behind the scenes insight etc. You don’t want this to go too long but it’ll give a few people a chance to join. Also in the first few minutes as you see people joining you should reach out and ask them to say hi to you. Ask people to share where they are in the world or something else that is relevant to your topic. For example I often start ProBlogger videos with an invitation to share your blog’s link. While we’re talking about how long it takes people to join lets touch on the length of Facebook Live videos. Recently at Social Media Marketing World I talked to many people who had been experimenting with FB Live and I asked many of them how long their videos went for. The common consensus was that people liked to go for at least 20 minutes. The main reason given was that it took time to get people watching (as I just spoke about) but also that the longer your video goes on the more interaction you get. It will vary a lot depending upon the type of video that you do but my own experience echoes this advice and my plan is always to go for at least 20 minutes. I’ve gone a lot longer though on my ‘Ask Me Anything’ videos and have peaked at 90 minutes (the limit for a single session) which was really well received. Going this long gave me a chance to answer a lot of questions and quite a few of my viewers said that they really enjoyed ‘hanging out’ in that way. I’ve seen a number of people do very short videos which might work for giving people a quick look at what you’re doing or where you’re are – but I suspect these wouldn’t get a lot of people watching live (it might be better for those watching the replay though I guess). I’m sure studies will be done at some point about optimal length of Facebook Live Videos but for now I’d try mixing things up! One of the beautiful things about Facebook Live and other live streaming services is that it opens up the potential of a more conversational experience with your audience. To be able to ask viewers questions and get their immediate feedback is great. To be able to take questions and serve specific needs of viewers is likewise a really fantastic thing. I often come away from Live Videos feeling like I know my readers a lot better and feeling as though they saw a glimpse of who I really am too. Of course this only happens when you take the lead and are engaging with your viewers rather than just talking at them. I think it’s really important to signal right from the beginning of your live video (and through to the end) that you want to engage. Greet people who comment by name. Ask your readers where they’re watching from. Come ready with some questions to ask your viewers (on topic and off topic). Signal that you’re ready to answer any questions that viewers have. Reward good commenting and encourage readers to share their own answers to other people’s questions. Ask readers to share examples to things you’re talking about. You might even like to offer a prize for the best commenter. It’s ok to have periods of your video where you’re more interactive than others (I’ll describe how I do this in the next point) but at least at the beginning, middle and end try to build in some form of interaction and engagement. Any engagement you get (comments, likes, shares) helps increase your reach so the more interaction you get from those live viewers the better! 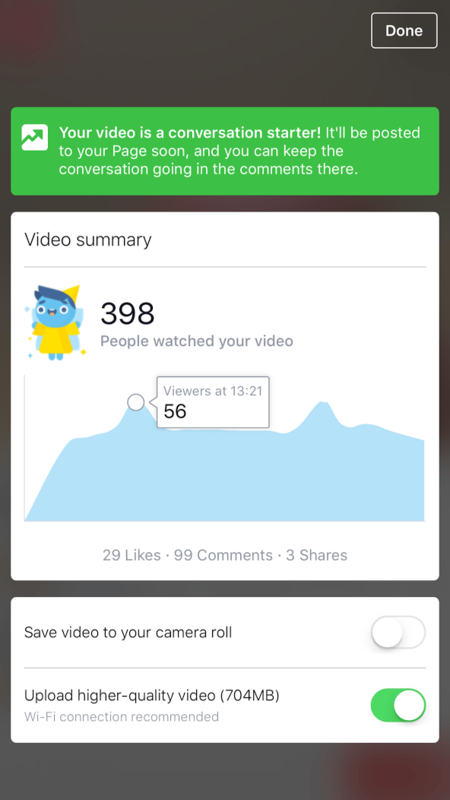 Last week I did a Facebook Live Video that was watched (at least in part) by 1300 viewers according to the stats I got at the end of my broadcast. In the following 3 days it had a further 1300 viewers. So remember that while we’re focusing a lot in these tips about looking after and interacting with the live viewers and creating a great live experience – those who watch after the Live broadcast is over could exceed those who watch live. As a result you need to create something that is as useful to them and which draws them into the experience as much as possible too. One of the things I’ve been doing in my Live Videos lately is spend the first 20 or so seconds of the video paying attention to those watching the replay. The reality is that most of the live viewers miss that part anyway as it takes them a minute or so to join and so it gives you an opportunity to acknowledge, welcome and tell the replay viewers what to expect. I sometimes mention that I love that they’re watching the replay of this live video and that I will spend a couple of minutes greeting those who are joining live and then will get into exploring the topic. Sometimes I even encourage them to skip to the 3rd minute where I should be into my talk. I guess it’s also worth keeping your replay viewers in mind during your video too. There’s a real art to getting the balance between interacting with live viewers and not annoying replay viewers and I’m not sure I’ve ever really perfected it – but what I do try to do is to give chunks of time in my videos to different purposes so as to serve both audiences. So after my short intro to replay viewers I will then spend a couple of minutes greeting live viewers as they come (as outlined in the point above) and then if my video is a ‘teaching’ video I tend to get into that mode which focuses more on delivering content and doesn’t have as much interaction. I usually tell people that I’m going to teach/talk for 10-15 minutes and encourage people to ask questions at any point – but say that I’ll come back to answer all the questions at the end of the teaching. In this way those watching the replay get the bulk of the teaching up front and then can end the video if they don’t want to watch the Q&A. I find that if I teach and take a question/interact, teach and then take a question/interact sporadically that the interactions can take over and take me off track – which I think I’d find a bit annoying as a replay viewer. 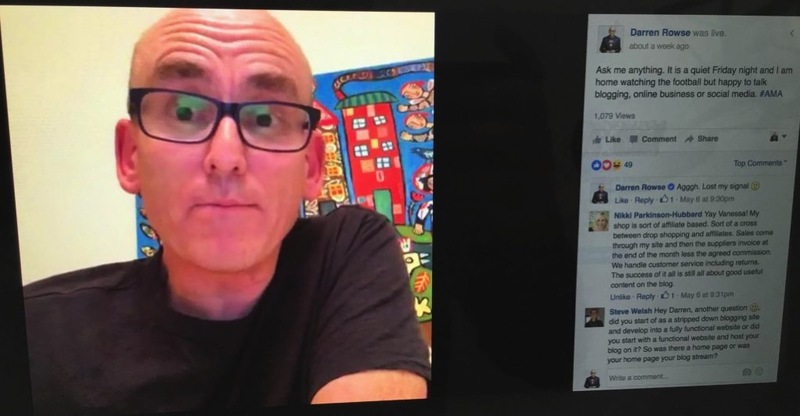 While we’ve been touching on interaction – it’s worth noting that one of the things I don’t like about Facebook Live as compared to Periscope is that there is currently a real lag between what you’re saying and what your viewers are hearing. I sometimes have my Facebook page open (on silent) in the background while I’m presenting so that I can add in links to the comments etc and it’s not uncommon to see a minute between when I say or do something and when I see it on my page. This is particularly worth noting while you’re interacting with those watching. If you ask a question and nobody responds, it’s probably due to the lag. So you might want to be willing to answer your own question or talk about something else while you’re waiting for the interaction. Similarly if you’re winding things up and saying goodbye – you might like to wait a moment or two to for others to say their goodbyes or ask last questions before you go. In the first few minutes of your video it can be well worthwhile to ask those watching to share your video. This helps you get more reach and hopefully a few more live viewers. You might need to ‘teach’ your viewers how to do this but it’s pretty simple – they simply hit the share link under your video and then can share it to their personal profile, a page or even a group that they own. I don’t find the ‘sharing’ of videos is happening as much as it does on Periscope yet but hopefully this changes in time. Facebook Live Video is not about being perfect (although in the last few weeks I have noticed production quality of some using it really increase). Rather, it’s about being yourself. Those watching your video will respond warmly to you if you’re warm, real and relatable. My sessions that have had the best feedback have been me sitting on my couch at the end of the day talking like I’d talk to a friend. These videos at time went a little ‘off topic’, showed my personality, etc. So while I’m about to give you a few tips on how to produce a better video keep in mind that what people really love is the chance to have a personal connection with you! Most people’s Facebook Lives at the moment are them sitting in front of a computer talking. This is getting attention at the moment because the medium is still relatively new – but in time it’ll be videos with some kind of visual appeal that will cut through more and more. Remember the way people end up watching your video is that they’ll see it as they scroll through their Facebook news feed and that the sound will be off until they click the video. So anything that has some visual appeal, grabs their attention and generates some curiosity will help to get more actual views. The other aspect of visual appeal is that it has the potential to keep people on your videos longer. There are numerous things that you could try with this and I’m seeing a lot of people experiment right now but a few things you could try include. This need not be anything too fancy (although I’ve seen a few people build custom sets for their videos). Even a bright colour wall behind you that stands out as people scroll through their feed might help. Other live video creators use Green Screens or get backdrops made. I sat in front of a piece of art in our kitchen recently and was amazed how many people commented on it. As I showed in yesterdays post we’re seeing people like Michael Hyatt add a monitor into the background of videos. This allows you to either show slides or to simply display call to action URLs, your Twitter URL or even your logo for branding. Another way to create a little visual interest is to utilise the fact that your phone has two cameras and can be moved around. If you’re in an interesting location – flip your camera around and show where you are. Alternatively get up and move around a little to change where you’re sitting mid video – simply to mix things up a little. This one is for those of you wanting to get a bit more serious in your live video and it will take investing some time and maybe even money – but there are ways to take your live videos to a whole new production level! I’ve just gotten access to Telestream’s Wirecast product (disclaimer: I was gifted it last night) which allows you to produce live video and really do some amazing things. It’s a high level product that can be used for professional applications but it is also something I’ve seen numerous small businesses use too – and it now also works with Facebook Live. The mind boggles at the kinds of things you could do with Wirecast! It’s certainly an investment (it costs $500 USD) but if you’re going to put serious effort into Facebook live then it could be worth considering. Another option to investigate in terms of tools that can do some of the above is OBS Project. I’m yet to test it but saw Cliff Ravenscraft testing it in the last few days in the following video in his new studio setup. It’s completely free (although depending what cameras you want to use you might need to invest a little there). I’m told OBS may not be as powerful or feature rich as Wirecast and might need a little more tech know how to set up – but it looks like one to check out – you can’t beat the price! It’s worth noting that tools like Wirecast and OBS have only in the last month been able to be used for Facebook Live since Facebook opened up their API. I suspect we’ll see a lot more services like these in the coming months. It’s an exciting time! One of the best things you can do to increase the quality of your videos is to make sure you’re in good light. We’re seeing some live video producers invest in lighting setups (like Cliff in the above video) but even just setting up near a window and making sure the lights are on in the room you’re working in will help. I invested in some LED lights like these last year and use them to add some more light to some of my videos. You can join them into one big light or use them as four smaller ones around your room. Light really will lift the quality of your videos (whether they are live videos or not). Note: if you wear glasses lights can cause reflections that can stop people seeing your eyes. This can be distracting for viewers and interrupt the connection you have with them. Consider getting yourself some lenses in your glasses that are non-reflective to cut reflections down. How you look is obviously important – but how you sound also makes a big difference. At the very least think about getting away from background noise and find a quiet spot to film. But if you have a little money to invest – consider buying a microphone to increase the quality of what you’re doing. One of the most popular miss for those using their phone for video is the Rode SmartLav mic. It’s what I use in most of my live videos. It’s not the cheapest option but is very good. There are plenty of other options for Lav Mics that plug in to your smart phone that are cheaper though – so don’t feel you need to go straight for the top of the field. Another good option for smartphone use is this directional mic from Rode which I see many people using. The benefit of this is that it means you’re not weathered to your phone. Of course if you’re going to invest in one of the tools like Wirecast or OBS Project you can use all kinds of higher end mics (the sky is the limit) but as I say above – finding a quiet spot and making sure your smartphones inbuilt mic isn’t obstructed can get you decent results. While we’re talking about gear – another good investment if you’re going to do regular Facebook Live Videos is some kind of mount or tripod. Firstly if you’re going to do videos that go beyond 20 minutes even a phone can feel heavy! Secondly there’s nothing more annoying for your viewers than a camera that is constantly moving, shaking and jerking around. A nice steady camera view helps a lot. There are many options here ranging from proping your phone up on whatever you can find on your desk to keep it steady (I used a coffee cup for several months) through to picking up a relatively cheap smartphone tripod through to investing into something more custom built for live streaming like this desktop stand for an iPad (for your notes) and a phone. There are many such products on the market for live streamers! One last gear suggestion – particularly for those going out on location who want to show different environments – is a lens attachment for your smart phone like the 4-in-1 Ollo Clip. I particularly like being able to use the wide angle lens that allows you to show a wider angle view of a scene that you’re showing off. This would be particularly useful if you’re a travel blogger wanting to do Live videos from on location of spectacular locations. Similarly if you’re wanting to shoot from an event or want to get numerous people into your shot in a tight location. If you’re broadcasting in public – consider those around you. I’ve seen a number of live videos in the last few weeks where people were at events and while live they bowled up to people and put the on the spot for an interview. This could work out well but it could also put people who don’t want to be on camera under pressure. I’d personally ask people’s permission before going live before featuring them in a video. If you’re broadcasting from home where there might be family about it might also be worth talking with your family about how and when you’ll use live video. At our home I tend to only do live video when my kids are not home. I don’t want screaming kids (or parents) in the background – partly because I don’t want my viewers to have to experience that but also because I don’t think it’s fair on my family to have to tiptoe around our home in case I might be live. There are also privacy and security issues that you’ll probably want to discuss with family in terms of whether you want your family featured and whether you might film in locations that identify where you’re living. As with all your content – consider calling people to action. If your video is long you could ask people to do a few things during your video but it’s worth thinking ahead before you go live as to what the number one thing you want people to do will be. If you know you’ll be calling people to do something have links handy and ready to share. If the link is long consider using a link shortener to make it easier to communication. If I’m sharing a link I will generally say the link but also add it to the comments of my video as I’m saying it (this means you’ll need to have your page/group open on another device to be able to leave a comment). One call to action that is worth doing is to call people to follow your page. I often do this at the end of a video. The reason for this is that often live videos get a wider reach number than the amount of people who actually follow your page. This is because Facebook seem to be really promoting live videos (in places like their Live Video Map) but also because people will share your video. As a result you could be talking to people who don’t already like your page. So say something like ‘If you liked this video follow my page to get notified when I do another one’. A number of times while I’ve been doing important live videos I’ve arranged to have one of my team members live on the video to help me out. This has usually been Laney (who manages ProBlogger) and she will watch the video and the comments coming. She will answer questions that people have, find links to posts or podcast episodes that I might mention or add links to calls to action that I might make. She also feeds me questions that I might have missed. I’ve not had any issues with trolls on Facebook Live (which is pretty remarkable as it happens a lot on Periscope) but having someone there with admin rights on your page could be useful for this too. At the end of the your broadcast a little chart comes up on your smart phone that shows you how many people watched live, how many commented, how many liked and how many shares you had. It also also shows you when the peaks and troughs of the viewer numbers were during your video. Pay attention to this and learn from it for next time. There’s also an option to save the video to camera roll (this could then be uploaded to Youtube or saved for use at another time and place). There’s also the opportunity to upload to Facebook a higher quality video (it takes time and you would want to be on wifi). A few minutes after your broadcast finishes you can also edit your video. To do this on desktop look at your video on your page and click the little arrow to the top right of your video and look for the ‘Edit Post’ option. This then opens up the option to add a title to your video, edit the description, to select a thumbnail, to select a CTA button, add a url and select tags for the video. You can also add captions if you want to and have the option to block embeds of the video if you don’t want people to share your video that way. This allows you to optimise your video for replay views and is well worth doing. If you’re happy with the broadcast and think it warrants it you might like to consider boosting your video. This will help you get it in front of more people and is particularly worth doing if your video has a call to action that helps to build your business. If your video is of a nature that might help your blog readers – why not embed it into a blog post? You’ve gone to the effort of creating the video so embedding it is a really simple way to repurpose it. It will also increase the number of people who see your video which should help your reach numbers and might have flow on effects into helping you get more attention in Facebook’s algorhythm. I would generally add some content around the video in your blog post so there’s something there for people who prefer to read. This might also be a good opportunity to call your blog post readers to follow you on Facebook for more live video interactions. 30. Be Useful and Have Fun! We’ve covered a lot of ground in this post (and I’m sure we could go on further). I’m really aware that while I’ve tried to create a list of tips here that help you create great live videos that it might also have made it feel overwhelming. If that’s how you feel – please don’t let it stop you experimenting. The main tip that I want to emphasise is that people respond best to people who create useful content that shows who they really are. So be yourself, show your personality and have fun! I’d love to hear from you on the topic of Facebook Live today. Have you given it a go? Have you watched others who have experimented with it? If so – what tips would you add? Note: this post includes a few affiliate links (to Amazon) which enables us to make small commissions when you make a purchase. This is one of the ways I make money blogging and helps us to keep the vast majority of what we do here on ProBlogger free. You’ve covered virtually everything. I’d say the most important part to me is your advice to “be useful and have fun.” Those are really the 2 essential things that sound so simple, but will really make your broadcasts gain in popularity. People like to be around folks having fun. So do it. People have problem that need to be solved. Be useful by offering solutions. So, if you’re going to do a presentation I think it’s always best to be prepared, not so much with great material, but much more important… prepare to be entertaining. If you can. It really helps a lot. Thank you for all the tips. I started few days ago doing live video. What I can say it is a great opportunity for everybody to be connected with friends, family and customers live. Thank you once again! This has been so helpful for me. I have yet to go “live” on any video platform but the last three posts have me closer than ever. Thanks for the practical advice Darren! Great Tips. Can you Please clear my confusion on Promoting our Live video on Facebook.? I was thinking to make an advert of our post while we are live. Does that make sense? I do comments on political situations through Live Videos and want to promote my Live video while I’m talking. Or I should Promote my page instead promoting my video? I Started few days ago doing live video. What I can say it is a great opportunity for everybody to be connected with friends, family and customers live. Thanks for this very informative post. I think having a mod for your live video is a great idea to help the flow of things, as well as mentioning that any unanswered questions will be answered at the end. Don’t feel you have to answer every question right away. It can seriously distract from the process you may have had in mind. This is an incredibly helpful post. Thank you. I’ve been thinking about diving into Facebook Live but didn’t have a plan, and this is a step-by-step guide to getting started. I really appreciate it! You have shared some very practical tips which are possibly ignored by many (including me). My favorite points out of the above 30 tips include “being fun”, “using tools that you require like a tripod or a mic” and editing. I believe if the video ain’t fun or crafty or useful, why should one watch it? IMO, we should create videos which we would love to watch. Moreover using a tripod and a professional mic is very useful primarily because it improves the experience. No one would like to listen to you if there’s lot of noise in the background. I remember using a cheap mic earlier which often brought me negative comments. After upgrading my mic to a better one, I have seen positive responses flow in. And btw, this is the most detailed guide I have come across on this topic. Cheers Darren! Some good ideas. I am not quite ready for a Live session, but I will review this before I attempt it. Some great tips! I work for a housing association and will probably be using it in quite a different capacity than, but there’s certainly a lot to take into consideration there. We broadcast our first ever Facebook Live video last week! It was totally off the cuff and only a short one, roughly 40 seconds and I panicked when I say we peaked at two viewers, but the replay amassed nearly 4 times as many views as we have ‘likes’ and reached nearly 6 times as many! It totally confirmed what we thought, in that it would prove popular and we’re looking forward to experimenting with it in future! Thanks again for sharing your tips and experiences. Hi Darren this post has been so helpful – thanks! I’ve just done my first live post into my group (yay! )… BUT my video was sideways on… so serious *head-tilt* required – note to self: must shoot in portrait mode! My piece to (phone) camera was was c. 4 minutes long but the clip posted on FB is cropped and ends at 2:11. I have no idea why this is? Can you help? Your post is awesome…extremely detailed and helpful. After putting it off for several weeks, I finally did my first live video this month. Even though my palms were sweaty and I had butterflies in my stomach, it turned out quite well despite being outside by the river and not getting the best internet connection. I really enjoyed the experience and plan to do more, and with your tips, my future videos will be even better. Thank you for sharing! I like your tip about preparing an outline for a video. Some of my friends seem to be able to do this just fine with a mental plan, but not me. I’ve found that I really need to write down my plan in order to keep it straight in my mind. Promoting the video sounds like a great idea, I will definitely give this a try. Thank you for all of the helpful tips, now I feel pretty confident that I can do this right! I did my first FB Live today, I set up a tripod as I was interviewing, and there is a 3 second delay to help me get to my seat – but is there any way to remote control my ipad (from my iPhone?) to hit the finish button? Otherwise I risk extreme close-up or cleaveage shot when it’s time to end my video. Thankyou for the awsome tips! im going to look into purchasing one of the lev mics and also the lens for wider views. i will also look at getting the tripod. All three are very useful. I also love how easy it is to read your blog so layman and no big words used. i could read with ease…. It would be great too if there was a way to end or hit the ‘finish’ button via a remote control from our phones. If you have any suggestions or tips for this that would be great.